Rosenfeld Injury Lawyers has an entire team ready to help victims. Truck accident victims and their families need help! Many die each year from truck accidents. These incidents can be completely life-altering, even if no one dies. If someone dies in a truck crash, then it is even more devastating. More must be done to right the wrong if someone dies. However, our experienced group members can come in and assist you. We will protect your legal rights. We will preserve your claim and maximize its value. To understand truck accident lawsuits, review the next few sections. Give us a call to learn more. We can show where and just how much you can recover. What is the Value of Truck Accident Wrongful Death Claims? Truck Accident Lawyers That can Fight for You in Chicago! The trucking business is a fundamental part of our economy. We get used to and acquiescent to the crashes that they produce. They crash into trucks, cars, motorcycles, pedestrians, and bicyclists. When they do, the consequences can be severe. Peoples’ whole lives can be irreparably altered. In fact, many people die every year because of truck accidents. How do people die in truck accidents across Illinois? The Department of Transportation has conducted a wide-ranging study with the trucking industry. It looked to find to out how accidents occur. It wanted to know why they leave so many people injured or killed. The results surprised people. Most truck accidents that cause fatalities do not happen because of driver error. They generally come about through external forces such as distractions. It is normally from overreactions (like oversteering) or fatigue rather than irresponsibility. 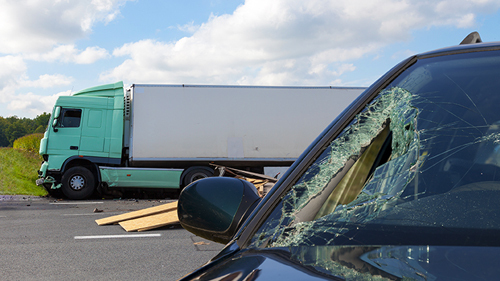 Here are some causes of fatalities in Illinois truck accidents. Trucks get into accidents thousands of times every year. These take many lives and cost millions of dollars. It is important to get the facts on truck crashes. This will help you better prepare yourself on the road. Make sure you don’t get into a similar incident! Almost 4,000 people died in 2015 from a large truck crash. Passengers in cars die almost six times more than those in large trucks when the two get into an accident. Over the last forty years, truck fatalities have decreased by almost twenty percent. In truck accidents, the vast number of fatalities are actually people travelling in cars. Their deaths outnumber the deaths of people in trucks involved in these incidents by a factor of four or five. Tractor-trailer trucks are three times more responsible for fatalities in accidents than single-unit trucks. More than half of the time that someone dies in a truck accident, more than one truck is involved in the collision. Over the last forty years, the rate of fatalities for truck accidents have decreased per mile driven by almost a factor of four. Most deaths from truck accidents occur on major roads, freeways, or interstates. Nearly half of all deaths from truck accidents occur during 3 pm and midnight. The day of the week is normally not an indicator of a potential truck accident fatality because they are pretty evenly split from Sunday to Saturday. Hopefully, this information gives you some more insight. Illinois truck accidents pose grave dangers. To get a better understanding, call our offices. Speak to someone from the Rosenfeld Injury Lawyers. We can show what you can do to recover. We can show you how much you can recover. Demand justice! Contact us today! People bring wrongful death claims for truck crash fatalities. Plaintiffs allege that the defendants caused someone’s death. They blame it on unreasonable or inappropriate behavior. The plaintiffs must have some type of special relationship with the decedent. Otherwise, they cannot bring a claim in Illinois. Siblings, parents, and spouses qualify as persons entitled to bring actions. Different people might be allowed to as well. Here are the boilerplate elements to truck accident wrongful death claims. Due to the intentional or negligent conduct of the defendant. The plaintiffs suffered economic or non-economic damages. How do most defendants respond to these allegations. They use certain tactic to defeat wrongful claims in Illinois truck accident lawsuits. First, they might say the driver was an independent contractor. Thus, the driver and not the company should be held responsible. Second, they might say it was the decedent’s fault. Third, they say the death was the result of an act of God. Intervening forces remove them from fault. Intervening forces might be another driver or lightning. They might use other means to show that they are blameless. Rosenfeld Injury Lawyers builds and protects successful claims. Wrongful death claims are no exception. We help plaintiffs dismiss the defenses noted above. We can help you craft a solid legal case. It will preserve every ounce of recovery allowed in Illinois. Call us today to find out more. If a truck crash took your loved one, you can do something! We can show you how! “What are wrongful death claims worth?” This is an important questions because lawsuits take time and effort. Grieving families don’t want to go through the process if they don’t have to. It is completely understandable. Consider these points if you lose a loved one. They will help you estimate the value of your claims. Did the person suffer prior to passing away? Illinois allows plaintiffs to recover for the pain, suffering, grief, and agony before death. Defendants are still on the hook after someone dies. How much did the loss cost you? Deaths create unexpected and significant expenses. There is more than just funeral bills and burial costs. Loved ones miss out on the income that the decedent would have made. Illinois lets recover for all of these things. You can also get money for other bills the tragedy created. How much did the loss affect your life? Many times, a loved one’s passing can intangibly damage our lives. We lose their affection, compassion, and support. If you were close to the decedent, you might get money for quality of life. You must show it was reduced when the person died. The closer you are to that person, the easier it is to show. These non-economic claims can mean a lot of money. These questions shed light on your wrongful death claim value. They are common in Illinois for truck accidents. To get a tailored answer to your facts, contact our office. Our attorneys are experienced. They can help you estimate your potential recovery. Sadly, even horrendous injuries are not the worst outcome of some truck accidents. Too many of these crashes involve the deaths of drivers and passengers. Here are some Illinois truck accident verdicts and settlements that involve fatalities. This case was a complicated collision. The victim, a 61-year-old woman, was driving down an interstate in Kane County when a truck clipped her from behind but the incident did not stop there. Immediately after the truck rear-ended her, her vehicle was sent over the median and slammed into by a semi-truck. She died right after this Ping-Pong collision. Representatives of the woman’s estate sued both truck drivers for negligence and wrongful death damages. Specifically, the plaintiffs contended that the first truck driver did not maintain adequate brakes sufficient to avoid rear-ending her and that the second driver did not maintain requisite attention to avoiding hitting her head-on. Neither defendant could conjure a decent explanation so they both sought to settle. The plaintiffs received $1,250,000- $250,000 from the first truck driver and $1,000,000 from the second truck driver. This Illinois accident had a lot of drama and a sad ending. A middle-aged man was riding along a highway in Cook County when debris flew into his direction. The debris was actually two tires that fell off a truck driving in the opposite direction. The tires hit his car and killed him instantaneously. The man was survived by his wife and children. They sued the truck driver not long after the accident for various damages arising out of his negligent conduct. The lawsuit alleged that the defendant did not properly maintain his vehicle’s tires, did not keep proper control of his vehicle, and did not hold sufficient records of the vehicle (a statutory requirement for trucks of that size). At first, the defendant denied any responsibility and claimed that the incident was beyond his control, but eventually he realized that his statutory violations and the decedent’s death spelled defeat at trial. Thus, he was willing to compromise. The plaintiff’s estate received a $4,640,000 settlement. A truck driver was proceeding along the 90/94 highway on the south side of Chicago when his vehicle suddenly stalled. The car driver behind him could not respond fast enough and crashed right into him. He died upon impact. The decedent was survived by a wife, two girls, and one boy. Representatives of the deceased man sued the truck driver in a wrongful death action under the Illinois Wrongful Death Act. They claimed that the defendant did not sufficiently keep his truck in a proper condition, left it stalled on the highway, and did not give the decedent enough space to slow down and avoid the accident. The defendant could not measurably combat any of these allegations so he agreed to the sizeable settlement amount of $1,000,000. A truck driver was proceeding along Route 31 in McHenry County when he fell asleep and drifted into the opposite lane. At that exact moment, another car was passing him and the two ran smack into each other. The car driver died at the scene of the accident. The decedent was only 25 years old. Apparently, the truck driver was on medication and had foolishly mixed that with alcohol earlier in the day. That combination likely impaired him and led to the accident. The victim’s estate sued the truck driver for damages and the defendant admitted responsibility prior to trial so the only issue in court was the extent of non-economic damages. The two sides were far apart: the plaintiffs claimed their damages were approximately $5,000,000 while the defendant contended they were closer to $100,000. The jury decided that $1,275,000 was appropriate-$62,000 for past and future services and $1,212,500 for loss of society. A woman in her early seventies was driving through the Illinois countryside when she entered an uncontrolled intersection. Without signaling and without yielding to her, a truck driver also entered the crossing and ran right into her broadside. She died from injuries related to the crash almost two months later. Her husband brought suit against the driver and the driver’s employer for damages from the crash. He claimed the driver was negligent in the operation of the vehicle and that the employer was negligent in supervising him and entrusting the vehicle to him. This rear-end collision took the life of a 66-year-old man. He was driving his truck along a Will County interstate highway when a semi-truck hit him from behind and caused him to loose control of his vehicle. He died not long after from injuries related to the crash. Representatives of the decedent, including his wife and two kids, sued the other driver and the other driver’s boss for damages. They claimed that the defendants’ negligence caused the victim’s death and that they suffered damages because of it including loss of support and companionship. The defendants refused this rationale and the controversy went to trial where a sympathetic jury award the plaintiffs $7,250,000. Hopefully this information shows you that you have options if your loved one is taken in a truck accident tragedy. Remember, we can fight for you to make sure that you successfully achieve every option available under the law. Our lawyers work on contingency so that you don’t need to worry about anything upfront. Just contact our offices and tell us what happened so that we can tell you what you can do!